The Beretta PX4 Storm is a versatile and durable pistol that's a welcome addition to the choices of semi-auto pistol for personal defense and concealed carry. It's fast and accurate, easy to disassemble and reassemble and even comes in three different calibers according to individual shooters' personal preferences. With high marks for accuracy and durability, this gun is popular with global law enforcement and private shooters alike. We've taken a look at this excellent weapon and all its specs, the pros, and cons of the gun, and where you can get it. We've also compared it to some similar guns to help you make an informed decision about the best pistol for your needs. What Is The Beretta PX4 Storm? The Beretta PX4 Storm is a double or single-action semiautomatic pistol with a streamlined profile that makes it perfect for an easy draw and easy concealment. 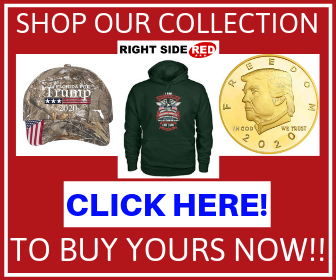 It comes in different styles and for 9mm, .45 and .40 caliber rounds, but by far the most popular is the 9mm pistol size single action with a 17-round capacity. The PX4 Storm is certified by NATO and is one of the most popular guns among international law enforcement and peace-keeping personnel. It has been reported to fire more than 150,000 rounds without a single break, in part because the gun is designed with as few parts as possible so there's less to go wrong. There are a number of things that make this weapon special. It has a short recoil barrel with one of the most powerful actions available. Yet a rotating barrel pulls the recoil away from the hand so that muzzle jump is slight. The result is excellent accuracy and speed. The PX4 has snag-free lines, a Picatinny rail in the frame, a manual safety, and a locked breech. Many of the parts on this weapon are interchangeable. The reversible magazine release and safety make it truly ambidextrous. Regarding pricing, the Beretta PX4 Storm is on the affordable side and is one of the finest guns you can get for under $700. Prices range from $450 to $650 depending on style and sales. Because of its durability, the PX4 Storm is also a good bet when considering quality second-hand weapons. The MSRP on this gun is just over $600, but it's possible to find it for a bit less than $500 on the right sale. The PX4 is simple to use well. Its durability, price, and accuracy make it the perfect gun for a new shooter. The smooth lines make it easy to draw and re-holster, and the rotating barrel effectively sends recoil away from the hand. This means more time shooting, better accuracy, and faster target acquisition. Its interchangeable parts make it easy to personalize. It's also very easy to take apart and clean. The weapon is ambidextrous and available in both single action and double action. The magazine holds 17 rounds, and the pistol comes with a locked breech, interchangeable backstraps, a manual and visible safety, and a slide-mounted decocker. The design of the Beretta PX4 Storm makes it easy to shoot, easy to fire accurately, easy to clean, easy to personalize, and endlessly durable. This weapon gets high marks everywhere for quality ease of use, even for those new to shooting. The only possible issue is that some report the sites need to be adjusted, and some shooters may not like the slide-mounted safety. 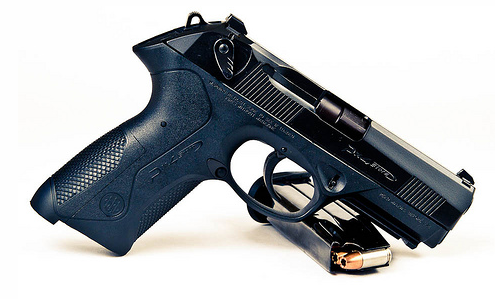 The PX4 has a one year warranty that is the same as all offerings from Beretta firearms. It covers the materials and workmanship. If the gun is registered with Beretta, there is an automatic two-year extension on the warranty. Only licensed repair stations are authorized to do warranty repairs. 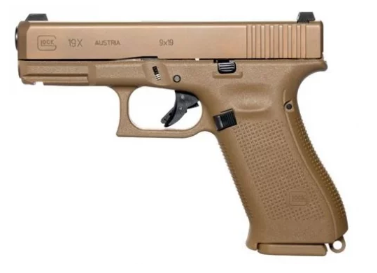 The Glock 19X 9mm pistol is double action and has a 17 round magazine. Popular with America's off-duty police for civilian carry, the Glock 19 has a reputation for reliability even under the worst conditions. It is a medium-sized gun that works well for discreet carry and will always feel the same on every trigger pull. This is the most expensive of the handguns we looked at, but that's fairly standard when it comes to Glock. You're paying for the name and the reliability it stands for. This gun is for the right-handed only. While billed as a compact gun, its weight and length really put it into the mid-range category. Other than these issues, it's simple to shoot and accurate even in less than ideal conditions. Because the gun is so light, yet powerful, it can be difficult to control. The gun comes in double action only and with center-fire ammo type. It has a polymer frame with a metal finish, features a Glock Marksman Barrel and a Coyote nPVD slide. The Glock is a solid gun and always a good choice. There's a reason that Glock products are popular with professionals worldwide. This particular gun is solidly reliable and balances well in your hand. The sights are not as accurate over long range, there is no trigger safety, and the trigger can be difficult to learn. The Glock warranty is less robust than Berreta's with no option for an extension. Even the original one-year warranty does not become effective unless the gun is registered within 30 days of purchase. Any unauthorized alteration to the gun renders the warranty void, as does using your ammunition. The Sig P320 was adopted as the official US Army pistol in early 2017, which is always a major coup for any firearm manufacturer. 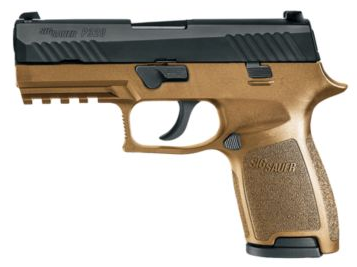 This is Sig Sauer's first striker fire gun and is meant to compete with the Glock in particular. 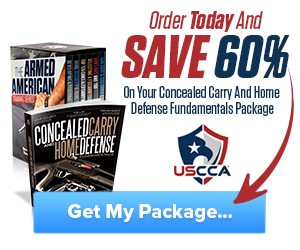 It features an innovative design and is good for personal defense or light duty. The gun can also make a good cheaper competition pistol. This gun is easier to find at a discount than the Glock, though a bit more expensive than the Beretta. Both the shooting and the safety systems are smooth and consistent. It's simple to change out slides and mags so it's possible to shoot any caliber you would prefer. It can be difficult to rack the slide without perfectly dry hands, and it can also be hard to get the mag to drop. The gun features a polymer frame built onto a skeletal steel frame. This means it's easy to replace the grip if it breaks. The gun features the best of both steel and polymer designs in a way that keeps the initial price quite low. It is easy to switch out parts, but much more expensive to do so than with the Glock. It has an excellent trigger and good sites straight from the factory. Overall this is a good design, especially for a striker. Although the bore axis is a bit high, it shoots straight and is durable even in bad conditions. The gun can bear conditions that would break ordinary polymer guns and also ones that would be too much for a metal frame gun. Sig Sauer won't even let you see the details of their warranty without registering a specific gun. By all anecdotal accounts, they offer a limited one year warranty and tend to stand by their guns even long after that warranty is gone. However, without specifics, it's impossible to say for sure what will happen in a specific situation. As with most guns, if you change out with non-Sig parts, use your ammunition, or modify the gun in any non-standard way, the warranty is voided. 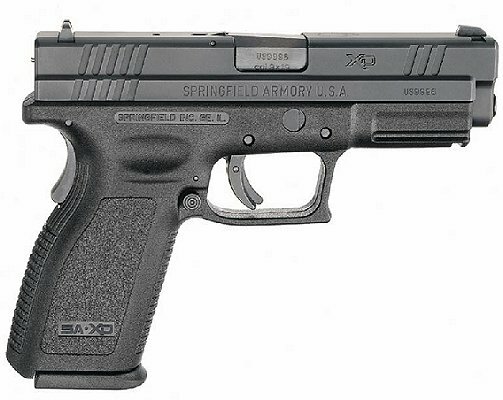 The Springfield XD is a 9mm pistol that is lightweight and features a full-length guide rod with dual captive recoil spring. The price of this gun is comparable to the Sig Sauer, and a bit lower than the Glock. It's more expensive than the Beretta and harder to find on sale. It has been designed around the 9mm round itself, so it feels good to shoot and is easy to conceal. It easily passed the "torture" test of 25,000 rounds fired in a row. This is a solid gun without being outstanding. It has a more ergonomic design than many other guns, but it's real claim to fame is excellent accuracy. It has a good trigger and very little recoil, especially considering the small frame and its lightweight design. The safety is easy to set or release once the gun is in the hand. It's impossible to clear the gun with a single hand because the slide can only be pulled back with the safety depressed. Again, the gun is solid without being amazing. It has a great trigger, but though it is technically single action, it can feel like a double action. Although the safety is easy to use, it's also easy for dirt and grime to get under it, at which point it becomes ineffective. It features Pro-Glo Tritium/Luminescent front and rear sights. 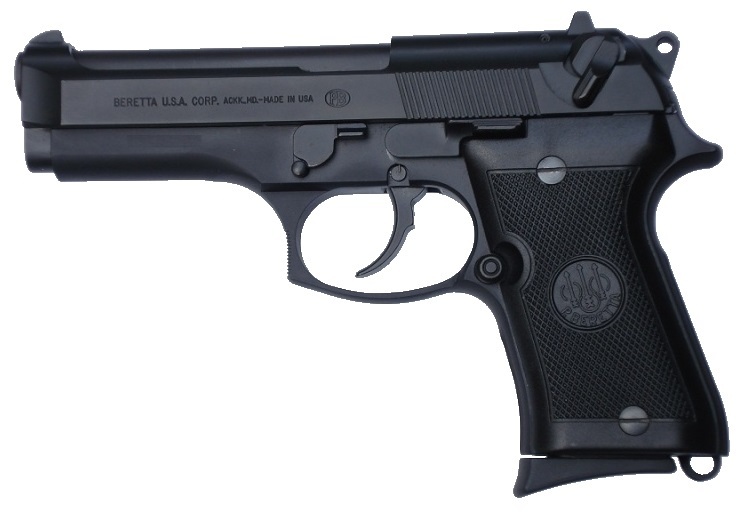 This is a good, reliable gun that can develop issues over time. The striker retainer pin tends to break with enough use, though Springfield reportedly replaces them at no cost. With enough firing, the magazine will stop dropping free, and the magazine itself is not very durable. After a few years of shooting, the loaded chamber indicator can get stuck in the "up" position. It can be removed, and the gun will function fine without it. Springfield's warranty is one of the best. The gun is under warranty to the original purchaser for life and does not require registration to activate. All it takes is notification to them by mail, fax, email, or phone that you have a problem. As with most firearms, the warranty is not valid if you make unauthorized modifications, fire or handle it unsafely, fail to store and maintain it properly, or use your hand loaded ammunition. Every gun on this list is a solid choice. They can all save your life in a pinch, and all of them feature good accuracy, reliability, and durability. There's a reason that each one is popular with law enforcement, military, and civilian shooters alike, and while the official warranty notices vary a great deal, the truth is that all these firearms manufacturers stand by their products. You can't go wrong with any of the handguns we've looked at here. That being said, our recommendation is the Beretta PX4 Storm. It's by far the cheapest, yet it offers the same kind of ease of shooting, reliability, and accuracy that the most expensive pistol has. The warranty is better than all but the Springfield as well. This is an affordable and reliable gun for personal defense and a solid choice for any shooter. Hey Buddy!, I found this information for you: "Reviews: Beretta PX4 Storm". Here is the website link: https://thegunrights.com/beretta-px4-storm/. Thank you.